The game comprises a various types of shots, different types of user-defined bowling variations and to completely use the mechanism of Don Bradman Cricket 14, a controller is required, even for PC. That simply means you cannot play Don Bradman Cricket 14 without a controller in your Windows PC as the controls are very complex which cannot be operated with a Keyboard. What we recommend is the XBOX 360 controller for Windows, which will work pretty fine. Pressing Y/B/A will determine a Length of the Pitch. This is the range of length you are aiming for. Pressing this will start the bowling run up. Note that the area of lengths are overlapping i.e. if you are bowling a GOOD length delivery and don’t time your release well. It can end up being FULL or SHORT depending how early or late you release it. 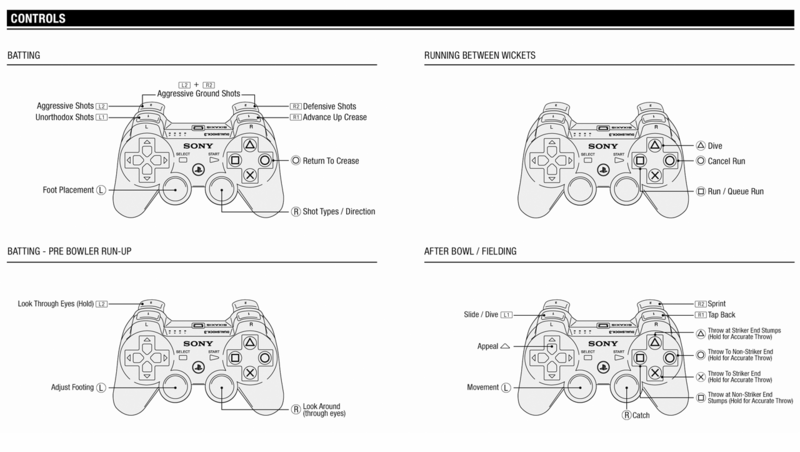 RIGHT ANALOG STICK (RAS) DOWN (Hold it) – This will make the bowler jump at the end of the run up. You will need to time this well, as it will affect where your bowler plants his front foot. Too early and that bouncer you wanted to deliver with your 2m tall bowler isn’t going to be as effective, too late and you’ve got yourself a no ball. The Speed you pull the RAS down will determine the speed of the ball that you are going to bowl i.e. If you pull the RAS down very fast, then you will have your bowler bowl his Maximum pace and depending how slow you pull the RAS down will determine how slow he will bowl. RAS UP – This will deliver the ball, when you release it and what position you push to, will determine the ultimate line and length of the delivery inside your original Length Range. If you don’t do anything after the Run Up then it will result in a dead ball. But if you just pull the RAS down and don’t do anything afterwards, the bowler will ball the worst possible delivery. If you press B for short delivery and then you wait late before pressing RAS UP this will give you the shortest possible delivery with your bowler. If you push directly up on the RAS your line will be just outside off stump, pushing up to the left or right of that position will affect the line accordingly. 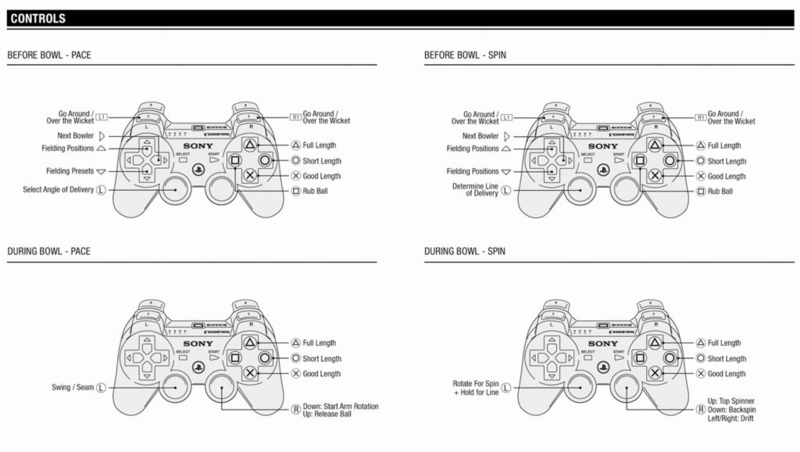 LEFT ANALOG STICK (LAS) – Determines how you hold the ball and will affect how the ball moves in the air and off the deck. Depending on the condition of the ball and the pitch, the game will dictate what you might need to do with both the LAS and RAS to compensate for movement. Note :- LAS control is still unannounced. There are still some room for speculations. LAS will determine the Line of the Ball. LAS held up straight will be aiming at offstump, moving it left or right will change the line across the crease. RAS – You must flick a direction on the RAS to determine the type of delivery. This will give quicker darted in bowls, floating, drifting, wind will play it’s part and working out the condition of the pitch and where you want that ball to land are crucial. Note:- RAS control is still to be announced completely as we still don’t know how we are gonna make those different kinds of spin balls with RAS. LEFT ANALOG STICK (LAS) – Adjust Foot Placement while playing a shot. D-PAD (Direction keys) – Controls the position of the batsman in the crease. Note:- NO “BALL MARKER” will be present in the game but we will be given some indication on where the ball is going to end up. Note:- Relay Throw control is still unannounced. So by now you must’ve quiet easily understood why the game can’t be operated with a keyboard. I personally think it can be, but you can’t enjoy the full experience of the game – the shots, bowling styles require complex actions which can be easily operated with a gamepad/joystick. If you think the Microsoft Xbox Controller is too costly for a PC, you can buy local ones – but yeah – they work only for months – they can’t be taken for granted. Well, that’s all for the Don Bradman Cricket 14 Controls List for PC,PS3 and XBOX 360. If anything’s missing you are most welcome to discuss it on our forums. How to duck in ps3, and how to play ramp shot? Where s pc controls for bowling?